2016 fundraiser is well underway! Each year the practice chooses a non profit to support through a series of fundraisers. AEA staff and physicians volunteer at a variety of events with the end goal of raising money and awareness for a local non profit. Our 2016 fundraiser will benefit IronGirls. Have you heard of this organization? IronGirls is a non-profit program designed to help girls navigate the complex transitions of adolescence by utilizing a physical fitness program to teach life skills in a safe and supportive environment.Through the mental and physical strength needed to complete a crossfit workout, the students learn life skills for health and wellness, and also assertiveness and self-confidence. AEA established a goal to raise money for IronGirls to be used to help the program expand to include more schools and more youth in Western North Carolina. Currently the program is available to middle school girls at the following area schools: The Asheville Academy for Girls, The Franklin School of Innovation, Asheville Middle School through the In Real Life (IRL) after school program of the Asheville City School Foundation, and Francine Delaney New School. IronGirls programming is available as an elective course at some schools and at others as an after school progam (such as the IRL program at Asheville Middle School). One important fact to know is that open enrollment is offered for the IronGirls program (even if the attendee’s school is not participating) and payment is available on a sliding scale. In its third year (the program was initiated in December 2014 by founder Amber Beane), the IronGirls program was expanded to include adolescent males this past winter. For more information about IronGirls or to find out about volunteer opportunities (training provided) with the organization contact http://www.irongirls.org This summer IronGirls will offer two sessions of summer camp which will run July 11-15 and July 25-29. Camp hours are 8:00am to 5:00pm; contact IronGirls for more informationhttp://www.irongirls.org Scholarships and transportation are available! This yea’r fundraiser events have included t-shirt sales, a bake sale, inspirational quote book sales, a yard sale and a staff volunteer team which helped out at the June 4 Asheville Half-Marathon to raise money for IronGirls (see the photo of Misty and Randy below who helped man a water station at the Half Marathon). On July 13 we invite you to our front lawn at 8 Medical Park Drive for a hamburger cookout lunch. 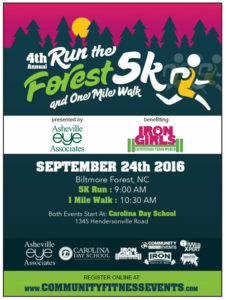 And our signature event, the 4th Annual Run the Forest 5K and 1 Mile Walk will be held Saturday, September 24. 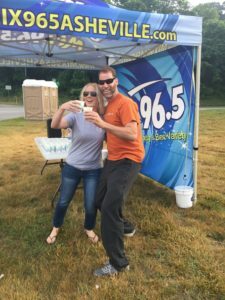 Registration is now open at http://communityfitnessevents.com/run-the-forest-5k/ for the events with early bird pricing discount available until August 31. Sign up now as an individual or a team. The 5K is a USTFA-certified course is somewhat hilly but accessible to newbies and experienced runners. 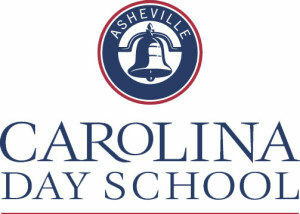 It starts and ends at Carolina Day School (1345 Hendersonville Road) and routes through Biltmore Forest. This year’s Run the Forest 5K is also part of the Asheville Track Club Grand Prix event series! Runners and walkers can sign up individually or create their own team, so get your team together and sign up your friends and family to help support this awesome program! The first 300 registrants are guaranteed an event shirt, free water and snacks and a “swag bag” . Cash prizes for overall top male and female runners, overall top male and female Masters runners and top three male and top three female runners in all age categories; check the reg page for all details. 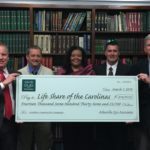 We’re really thankful to Carolina Day School, our Platinum Sponsor again this year, and to all of our community partners who have supported our fundraiser this year. Hope to see you July 13 and/or September 24! For more information please contact Katy Farlow at (828)258-1586, Ext. 2331.